Hi, my darlings! This has been quite the trying weekend for me! Despite it being unseasonably warm all week here in NYC followed by a sudden drop in temperature on Thursday, I managed to catch a miserable head cold and spent pretty much the whole weekend curled up in bed. Just when I almost had all my lil duckies in a nice lil row. Boo! Anyways, even though I'm still pretty miserable, it's time to power through tonight and the next three days of work til I get to go to DC! So, there is my light at the end of the tunnel! 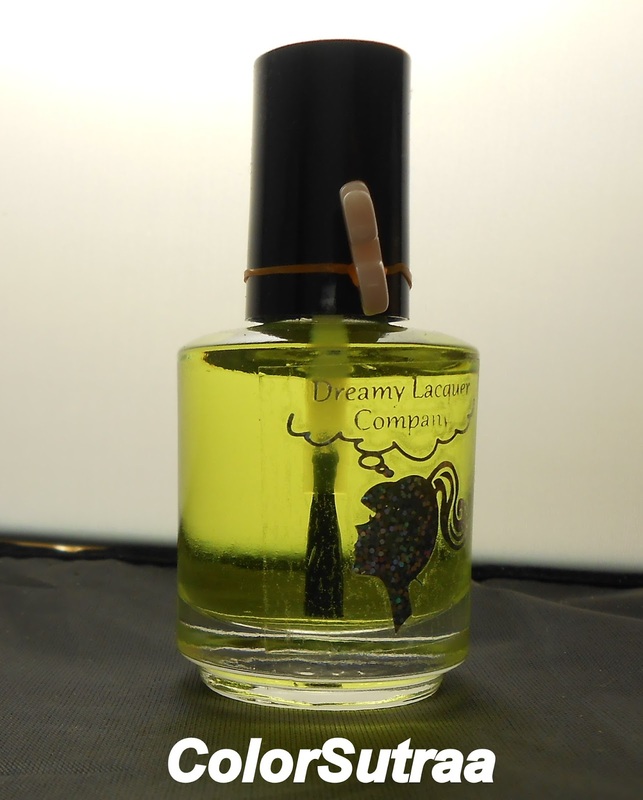 In the meantime, to cheer me up a little more, I'd like to present you with a new-to-me indie brand that I've kinda fallen in love with--Dreamy Lacquer Company! I was introduced to Dana when she graciously answered my open call for makers to participate in my big blogaversary giveaway--one look at the holographic labels on her bottles and I was already sold! Dana has been nothing but a pleasure to work with and tonight I'm super excited to present four of her beauties to you! First, I have for you Raspberry Sherbet--a soft, baby pink creme. The formula on this was just perfect--creamy and just the right consistency. Application was super easy and the swatches below show 3 smooth coats by itself, topped with 1 thin coat of G&G's HK Girl to finish the look. This is a lovely, feminine shade sure to satisfy all the your girly cravings! 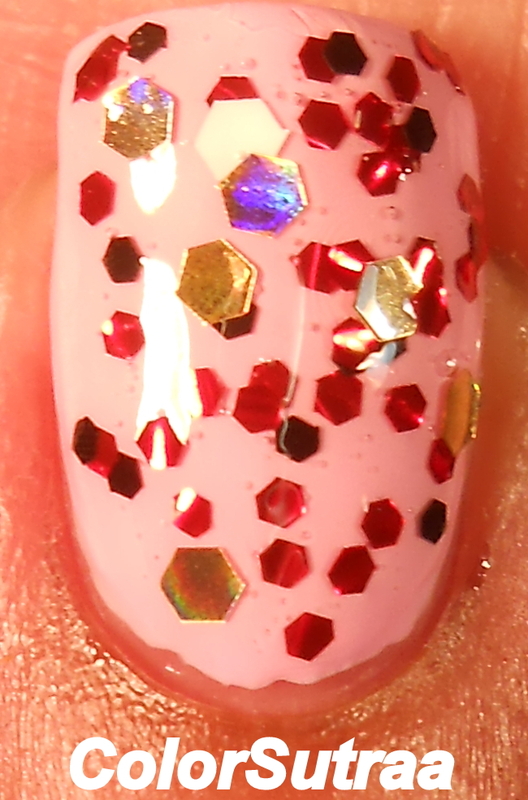 Next, I have for you The Pusher--a clear glitter topcoat full of red and black hexes accented with large white and metallic gold hexes. Again, great formula and application--just the right amount of glitter came up on the brush to allow for good coverage without clumping or fishing! 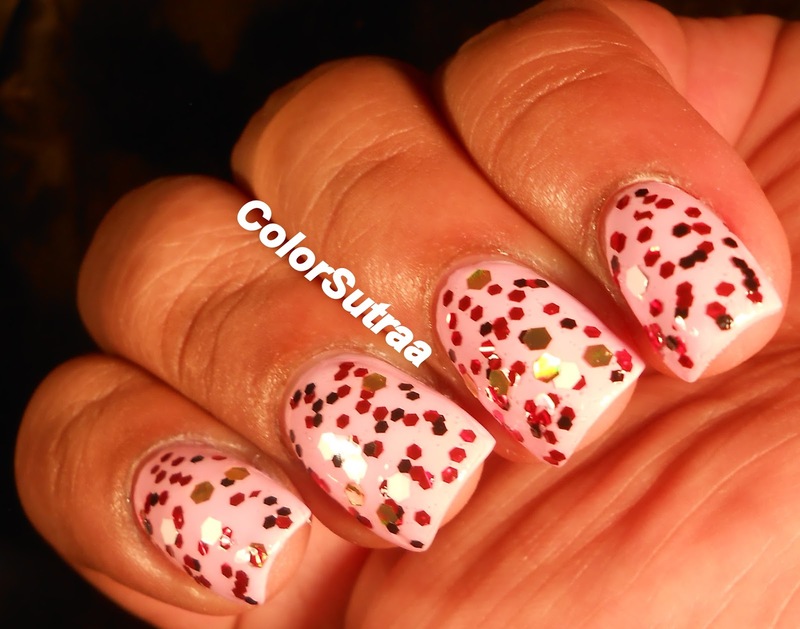 The swatches below show 2 thin coats of The Pusher over Raspberry Sherbet, topped with 1 generous coat of G&G's HK Girl--though I didn't spend any time meticulously placing the glitters, I did find dabbing it on rather than brushing from root to tip worked best for glitter placement. 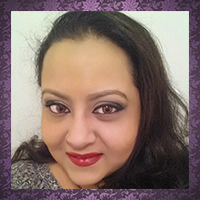 The resulting look is edgy and brings a new dimension to the sweetness of Raspberry Sherbet! The third polish I have for you is Devil Grass--a pale, pale green shimmer polish with added green and dark green microglitter. Again, no issues with either formula or application and the swatches below show 3 smooth coats by itself, topped with 1 thin coat of G&G's HK Girl to bring it all together. And before I sign off, I'd also like to show you another sweet little treat that was included in my review package! Dana packed this lovely cuticle oil in a light peach scent--although I haven't had a chance to use it extensively, my first impressions of it were quite favorable. The scent was light, very mild, with just a hint of peach and the oil itself absorbed fairly quickly without leaving a greasy residue! All in all, I would recommend you to try this if you prefer mildly scented cuticle oils over the more intense varieties out there! So there you have it, my darlings! My very first review of four beautiful polishes from Dreamy Lacquer Company! If you would like to add any of these pretties to your stash, you can find them HERE for the price of $8.00 for a full-size, 15 mL (0.5 oz) bottle. Be sure to follow Dreamy Lacquer Company's FACEBOOK PAGE and INSTAGRAM for all the latest news and updates! Omigosh!!! I'm so glad you feel the same!! I told Dana I would cry if she didn't bring this out!! !